The CV93 deep dish is our own patented design, inspired by some of the best OEM styles we've seen, but with the addition of a special twist. 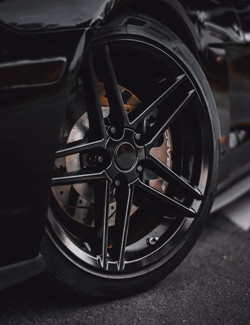 They are 22" x 9.5" deep dish style wheels, and they come in a variety of finishes. This package includes a set of four stunning black on chrome rims, with a beautiful chrome plated finish and interchangeable black inserts. The CV93 deep dish is designed for many GM full-size trucks and SUVs, including the Silverado, Tahoe, Suburban, Yukon and Escalade. 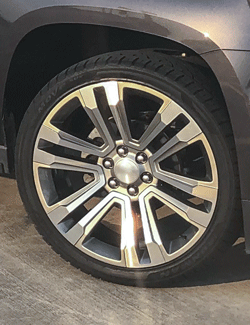 We pair these rims with four 285-45-22 Bridgestone Dueler Alenza tires, and include free mounting and road force balancing. As with all our wheels, clean with soap and water only, and dry with a microfiber cloth. A light coat of wax can also be applied for added protection.